Beethoven once said, "If my music had words it'd be a lot more popular." His wish has come true! 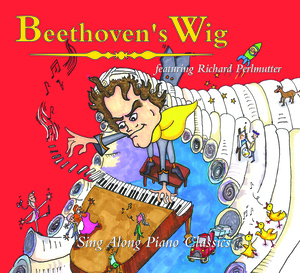 Modern day singer and “co-writer” Richard Perlmutter has added lyrics to Beethoven (and Bach, Mozart, et. al) that have propelled the works of the old longhairs to the tops of the charts, and introduced them to new audiences everywhere. Two chart topping #1 albums on Amazon. 4 Grammy Nominations. 5 Parents Choice Awards. Concert appearances nationwide. 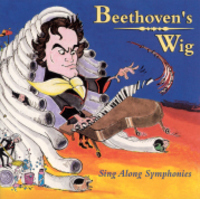 Beethoven’s Wig is BIG! Watch the animated video for "Beethoven's Wig" Winner: Best Short Animation for Children, Ottawa International Animation Festival. Video produced by Smiley Guy Studios. Watch more animated and live videos at our YouTube page. "An irreverent, witty approach to music appreciation… a laugh out loud that pretty much guarantees listeners will forevermore recognize the classics." "Perlmutter's got goofball charm…the orchestra's great, and his lyrics are truly hilarious." "What's the most far out place you could find a recording of Beethoven's Fifth Symphony? The answer lies in the CD itself." — Susan Stamberg, National Public Radio "All Things Considered"
"After we played "Beep Beep Beep" on the show, it may have set the record for most "how do I get that" e-mails from listeners"